I'm making good progress... I've worked out all the connections now. I think I need more powerful reading glasses -- SMD really does your eyes in! I've decided to provide switches to modulate the PWM directly from the LFO or EG2. I won't bother with an external socket input for now, but can easily add it later if needed. 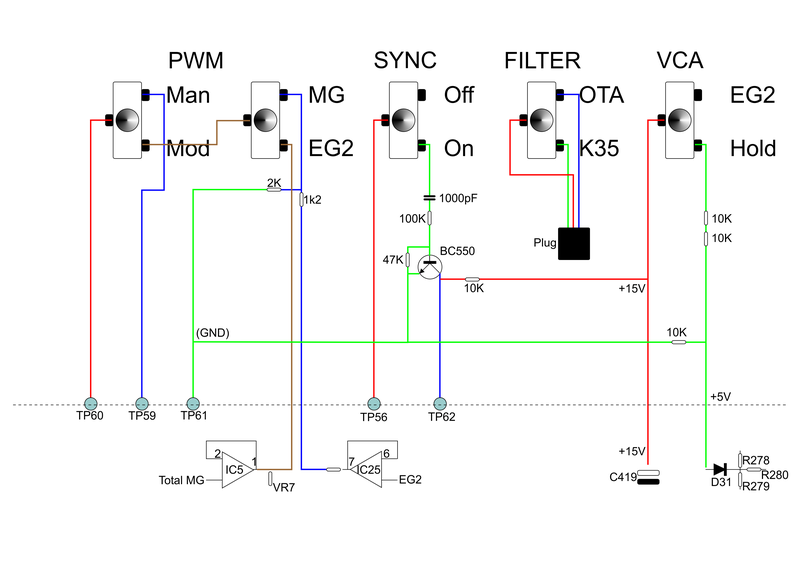 Another switch will provide VCO2 Sync. I'm abandoning the FM mode for now as it gets very complicated very quickly when trying to separate out the mod inputs to the two VCOs. The Filter switch is trivially simple, and the last switch is to hold the VCA permanently open, which is handy if I'm processing external sounds or just don't want to have to keep a finger on the keyboard! I can't squeeze the switches onto the front panel, sadly, there just isn't enough room, so I'll mount them on the top, where there's plenty of space for other controls or sockets if needed later. A while ago, visiting a customers own engineering workshop, I saw the ultimate in D.I.Y. bench lamps. There was a very large magnifier with a tightly packed ring of LEDs. This was suspended from an extreme angle-poise type assembly. Only this thing was jointed and balanced so well that it stayed exactly where, and at what angle you put it. There were no springs - just friction bearings and counter-weights. Oh, and those LEDs? They were RGB+W. Not only were they very bright full on, but you could vary both the brightness and the colour temperature!!! It's astonishing how much difference the latter can make to the detail you can pick up. After I'd finished drooling the guy said "Before you ask, No"
I'm very tempted to try building something like it myself. The electronics would be easy enough, but I don't have the mechanical skills to build the support system. 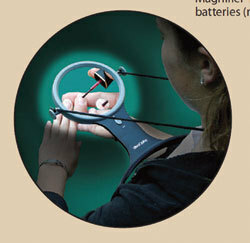 ... now, where can I get a really big f*** off magnifier? It's got superconductors inside? Wow! Folderol wrote: A while ago, visiting a customers own engineering workshop, I saw the ultimate in D.I.Y. bench lamps. No wonder you're permanently tanned. 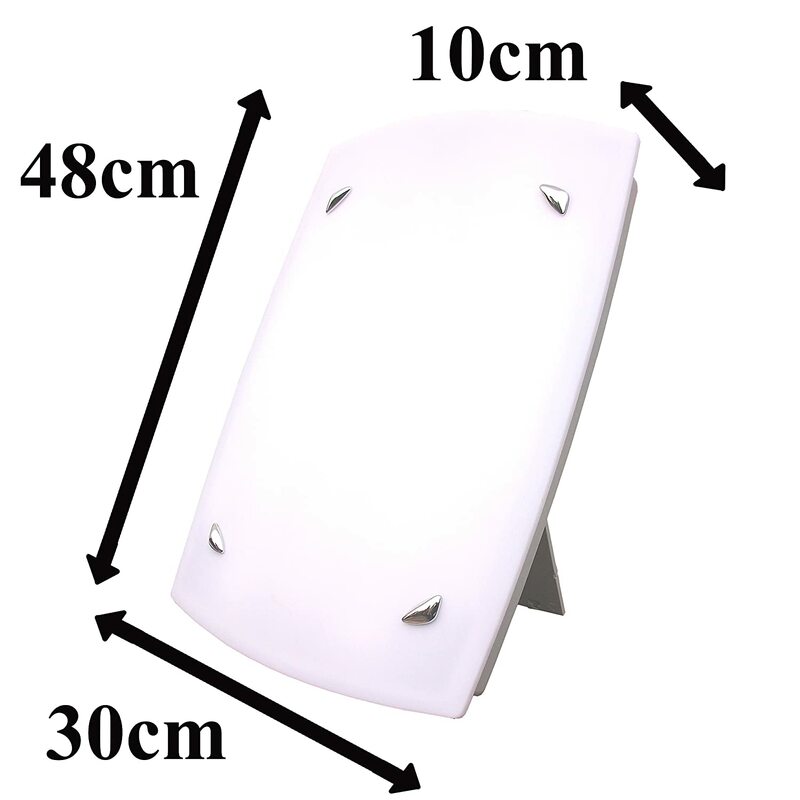 Just a quick update on the MS20 Kit modifications I discussed earlier. Managed to finish the mods and put the whole thing together today. Everything working as expected/wanted. Most of it is very obvious and straightforward. PWM -- I have two switches, the first selects normal or modulated, and the second the modulation source, which is either the LFO (MG) or the second Envelope Generator. The LFO source comes from IC5 pins 1/2 (bottom left of main board), while the EG2 source comes from IC25 pins 6/7 (bottom right). The EG signal is attenuated slightly to make it the right voltage range. 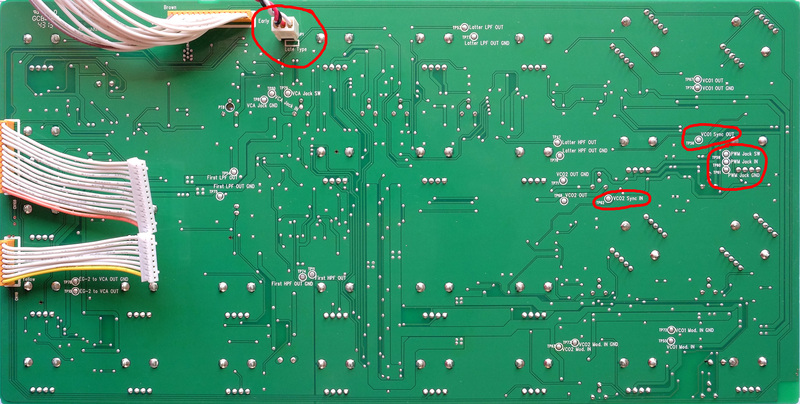 The connection points are the marked pads on the rear of the main board (see below) The only modification required to the board is to remove a '0 Ohm resistor' (R275) just under the PWM pot (see image below). I simply cut it in half with cutters, and unsoldered the remaining bits! This resistor is there to provide a link between TP59 (marked jack switch, which is connected through a resistor to the 15V supply) and TP60 (marked jack in connected through a resistor to the PWM pot), and it needs to be removed to allows effective external PWM control. The switch effectively restores the 0 Ohm link in its normal position. Of course, if you wanted an PWM control input socket instead of the selectable MG/EG2 that I wanted, you could simply wire a TS socket (with normalling contact) to the three pads. TP59 goes to the normalling contact, TP60 to the tip contact, and TP61 to the sleeve contact -- but you'll still need to remove the 0 Ohm resistor R275. SYNC ON -- the Sync mode requires a little extra circuitry if you want to make use of the oscillator circuit buffering that's already on the board -- as opposed to the simple diode link referred to above. It's just a simple inverter built around one transistor. TP56 (VCO1 sync out) connects through the switch to the base of an NPN transistor (I used a BC550) via a 1000pf ceramic cap and a 100K resistor. The base is coupled to the grounded emitter via a 47K resistor and the collector to the +15V supply via a 10K resistor. The inverted output from the collector is returned to TP62 (VCO2 Sync In). 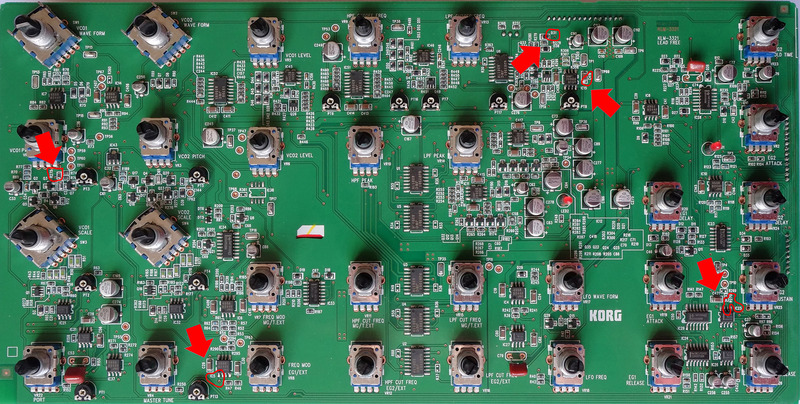 I derived the +15V supply from the lower side of capacitor C419 which is near the top right, just below the connecting loom on the top edge of the main board. VCA HOLD -- This +15V supply was also fed via a switch and a potential divider (comprising two 10Ks in the top leg and one more 10K in the lower leg to ground) to the anode of D31 which is a control input to the VCA. D31 is just above and to the left of C419. The VCA requires 5V to be fully open, hence the potential divider! When activated the VCA stays fully open regardless of the EG2 settings. I find it useful when setting up a sound or processing an external sound, instead of holding a key down! The only other mod was to borrow the three-pin header plug from a redundant computer fan and connect that to a switch to select the two filter modes. The circuitry and wiring was all built on veroboard and mounted on the back of the switches which I fitted to the top surface of the front panel, aligned with the control sections they affect. Hope that helps anyone else interested in tweaking their MS20 KIt. 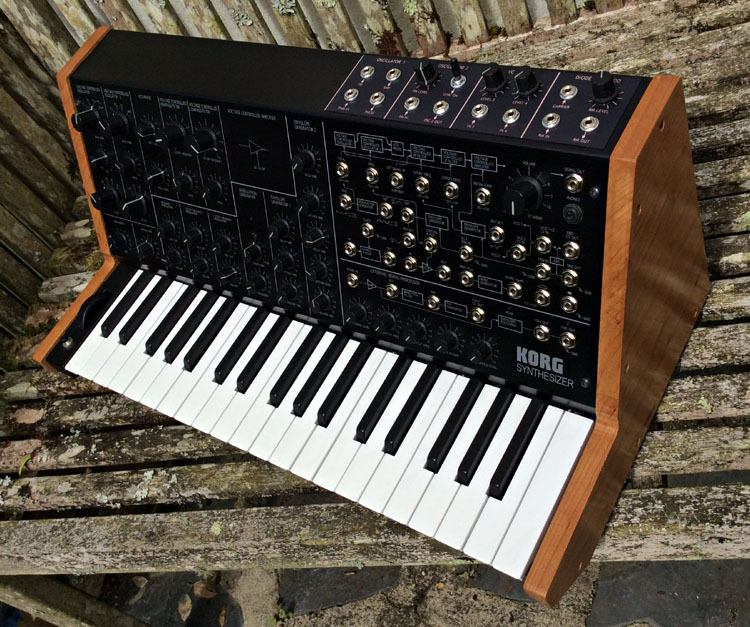 I can't say how these mods relate to the MS20 MINI I'm afraid, but I expect the circuitry is very similar. The sync circuitry is essentially the same as that in the MS20M kit (keyboard-less desktop version). Needless to say, any mods are undertaken entirely at your own risk. The mods as described work for me, but I can't guarantee they'll work for you! Thanks Hugh—can we make it a sticky? I'll have a go in the summer. New: Tim Bowness album 'Lost in the Ghost Light'. Feat: Colin Edwin, Bruce Soord, Hux Nettermalm, Kit Watkins, and the legendary Ian Anderson. Excellent—it's going to remind me now every time I come to the forum. Well done Hugh! You can actually see those components? I can barely see the board. There's green there somewhere right? Zukan wrote: Well done Hugh! You can actually see those components? I can barely see the board. There's green there somewhere right? I must admit the surgery to remove the 0 Ohm resistor did require the aid of reading glasses AND an angle-poise-mounted illuminated magnifier! I am increasingly finding that I have to combine the angle-poise magnifier lamp and reading glasses these days. And that's just for the instructions/manual !! Well... the PWM mod works. But I've somehow lost the function of most of my keyboard trying the more elaborate FM mods! The first 8 keys work, the rest do nothing..... via midi it works fine. Can anyone help me out of my numerical mess? Sorry to hear this midierror! All I can say is that my mods use tried and tested tweaks, worked perfectly on my MS-20 Mini, and none of them cause radical changes to the original circuitry that could result in the things you're experiencing. I can only think that you perhaps got a solder bridge in the wrong place when making the mods (SMD circuit components after all are extremely tiny, and I had to use a magnifying glass to see what I was doing). It is however difficult to fault-find by remote control - let's hope someone else has an idea or two as to why only your bottom 8 keys still work, as that makes absolutely no sense to me. yeah its quite strange really. I soldered with a magnifying glass and was exceptionally carefull. I think it may have been a pull on the connecting cables from one board to the next. I wonder how the keyboard functions? I have no problems with midi in. I am reluctant to dismantle the keyboard as I never went anywhere near it. Annoying as I have a gig next week!! Almost any instance of # keys work OK but # keys don't, is as a result of keyboard connectors coming loose, either over time or as a direct/indirect result of opening up a cabinet - especially if all is working via MIDI in. Or, as Martin says, just possible that something (solder/wire/screw) is shorting part of the keyboard detector circuit, again as a direct/indirect result of opening the case. No choice but to open up, look for any visual clues and reseat any connections.